The second oldest of six children, I grew up on Cape Cod before it got crowded. My dedication in Double Header is true. “I credit my father for showing me the power of dreams and my mother for teaching me the value of working for them.” After 23 years of marriage, I was widowed. Eight years later, I was blessed to remarry David James. We live in Southern New Hampshire, where we are connected to a wonderful church family. Together, we have five married children and ten grandchildren—so you know what our vacations are like. Decades ago, I had a great high school English teacher who used drama to make reading and writing fun. Since I wasn’t athletic, writing seemed less dangerous. And with no musical talent, I thought writing would be less annoying to my family. What can you share about your journey to getting published? It was just about as frustrating as it is for most writers. Patience has never been one of my heartier character traits, but I learned a lot during the wait—mainly how to improve my writing. My first novel, Party of One, was chosen a semi-finalist, then a finalist in the Christian Writer’s Guild Operation First Novel. When it was time to enter again, I entered my second book, Double Header instead. I won a book contract with that entry. I just finished my third book, Manhattan Grace, and I think it’s better than the first two. I hope I feel that way about the next one. What words of advice would you give to beginning writers? Get thee to a critique group! Then listen and don’t talk as they critique your excerpts. If you have to explain why you’ve written something, it needs to be rewritten. I learned so much from the experiences and perceptions of my fellow writers. Sometimes the best advice I got was from avid readers, not writers. While your book, Double Header, is what I would call a character-driven novel, it is also a sports story. I was impressed with your knowledge of baseball. Are you a big sports fan or did you need to do extensive research to pull it off so well? Growing up, my siblings and I were not into sports at all. But, later, my husband and children were. Living with crazy Boston fans, you learn a lot through osmosis. Of course, I did my research too. Was there a reason you decided to write Double Header in the first person, which is not as common as third person stories or omniscient? Is “I didn’t know any better” an acceptable answer? To be honest, Party of One, my first novel, started out as a memoir—written in the first person. When I had trouble naming names and telling truths that might hurt people, my husband suggested I switch from non-fiction to fiction. I kept the first person POV without thinking about it and continued using it in Double Header. My third novel is third person POV. Please tell us a little more about the story. Is there a message in your novel that you want readers to grasp? You may think you’re in control, but you’re not. God is in control. My protagonist, Casey, has mapped out every area of her life. The only thing she couldn’t control was her father’s cancer. After he dies, she idolizes him even more. When she finds out she has a half brother, a fact unknown to her father, she must let go of the past and find freedom in forgiveness. The still, quiet voice of God shows her how. God often teaches us something through our writing. What did you learn about life, faith, or yourself in the process of writing Double Header? Casey’s letting go was a big lesson for me. It has freed me to enjoy writing for God’s glory not my own. There’s so much less pressure knowing I am not in control of the outcome! Do you have another book we can anticipate seeing soon? I’ve got a few beta readers reviewing my third novel, Manhattan Grace. Set in New York City, a nanny and aspiring actress is mentored in her faith by a fatherly rabbi while she helps him pursue an unlikely romantic relationship with a famous, Moldovan opera soprano. When these two innocents find themselves embroiled in a jewel heist at the Metropolitan Opera House, they help solve more than one mystery. Since Mountainview Books LLC is a traditional publisher with a distribution source, you can request Double Header at your local bookstore. If you’re in a hurry, there’s always online ordering at Barnes & Noble or Amazon. 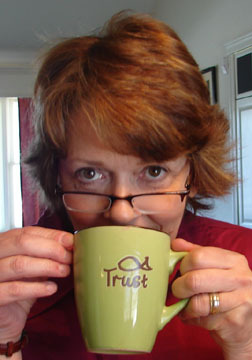 Clarice G. James loves to read and write smart, fun, relatable contemporary women’s fiction. After many years of writing and editing for business and ministry, she now enjoys the freedom that writing fiction allows her. Clarice has been a follower of Jesus Christ for over 35 years. She and her husband David live in Southern New Hampshire. Together they have five married children and ten grandchildren. Double Header is her first published novel. It was one of three winners in the 2014 Jerry Jenkins Writers Guild Operation First Novel contest.